Is what I absolutely did not write on my Uzbekistan customs form. 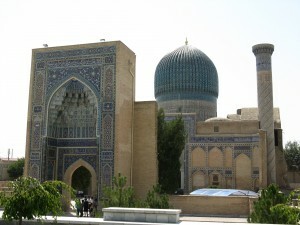 I successfully navigated Tashkent airport twice, and got home on Tuesday night. The house is now strewn with laundry, and I face the mammoth task of sorting and labelling my photographs. I had a brilliant trip. It was blisteringly hot, but on the plus side that meant it was low season and the sites weren't crowded. 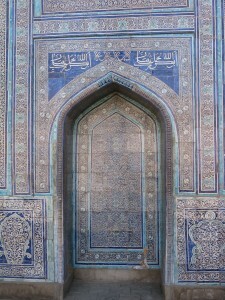 Samarkand lives up to its billing, and some of the monuments are magnificent, one fantastic scene after another, but as well as the notable sites I had a lot of fun just walking around or people-watching from the window of a mini-bus. It was my first time not only in Central Asia, but in an ex-Soviet state** and the combination was fascinating, not least the clothing which was wildly different from that described in the guidebooks. The fashion, of course, is very different from the UK, with a lot more gold teeth, but the recommendations for conservative clothing and long sleeves (I'd ignored the latter anyway) were considerably off the mark; if I'd followed guidebook advice, I'd have been wearing more than all but two women I saw in the entire country***. Food and infrastructure were both better than I had expected (though my expectations were not high), but it is not a land that goes in for puddings: I think I've had my watermelon ration for the next ten years. 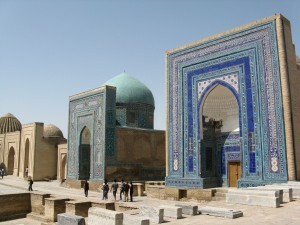 An Uzbek family with their guide, visiting a shrine. It was very easy to take photographs of people, because they'd usually taken our photos already. *James Elroy Flecker, The Golden Road to Samarkand. **Not quite true - I have spent a day in Tallinn. 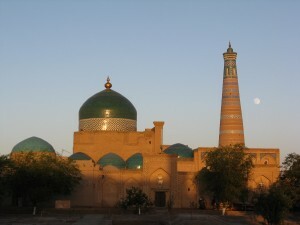 ***There were some fabulous photographs in Khiva taken by Khudaibergen Divano, who did a great deal to introduce photography to the region. Alas, I have not (yet) found my favourite online, a group of young people in 1925, dressed in the height of global student fashion with the women in drop-waisted frocks, stockings, and cut-out shoes, and titled Intelligentsia.